I’ve been slowly but surely learning some lessons in the past couple of weeks. Shall we discuss? 1) If you happen to be jogging and someone pulls to the side of the road, rolls down their window, and extends their arm out towards you to hand you some sort of piece of paper, don’t stop. Keep jogging. Maybe you thought this piece of paper was just some sort of pamphlet. You have been getting a lot of Jehovah’s Witness pamphlets lately from the nice people that like to knock on your door early in the morning when you aren’t wearing pants. What’s another one, right? Wrong. This is not a godly pamphlet. This is a crudely written note stating “Please you call me.” Elaborate, right? Is he driving around with a stack of these things? Well, more elaborate would be the stick figure drawing off to the right of his written plea. Although the arms and the legs are stick-ly, he has managed to tack on what I can only describe as a shocking portrayal of genitalia. Jog. Jog faster. 2) If someone knocks on your door and you are not wearing pants, it’s usually a Jehovah’s Witness. Don’t get me wrong, I have no problem with them. Everyone has freedom to their own beliefs. The problem I have is how often they seem to knock on my door when I am pants-less. Don’t open the door when you aren’t wearing pants, even if you think you can just peek your head through and cover your body with the main part of the door. You have a crazy Golden Retriever. She will try to get outside. You will be on your door step with a couple of Jehovah’s Witnesses, pants-less, trying to wrangle your dog. This is uncomfortable for everyone. Also, can we discuss how every single one of the pamphlets I receive has some version of kids smiling while eating a bounty of fruits and veggies, along with some sort of moose or other woodland creature. I’m confused. Probably as confused as the poor JWs were because I wasn’t wearing pants at 2:00pm on a Tuesday. 3) Don’t try and create a blog recipe when you are two steps past hungry (aka “hangry”). You will fight with your husband. He is just asking how he can help. Should he light the grill yet? You say some words. Loudly. Some might call this yelling. Everyone would call this irrational. 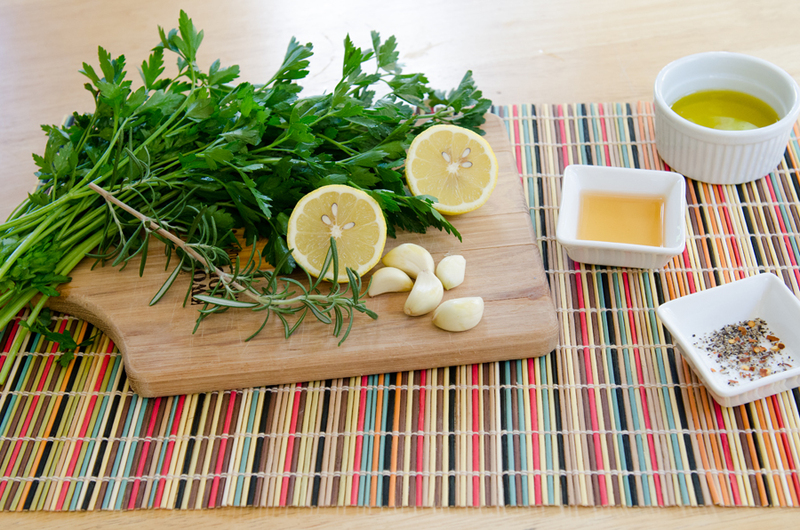 You are hell bent on making some gosh-darn chimichurri and photographing it all. You put the bowl on your food processor wrong after you have already added in all of the ingredients. You have to fix it and you get olive oil all over your hands. You yell some more. No one else seems to understand that this is the WORST THING EVER. Oily fingers on your Nikon body, plus the irrational emotional cloud of hunger that has taken over your body is REAL. Your husband suggests a cocktail. This is a wise suggestion. You sigh loudly while making it. You don’t even know why you are sighing. You both decide on an outdoor picnic. This helps everything. 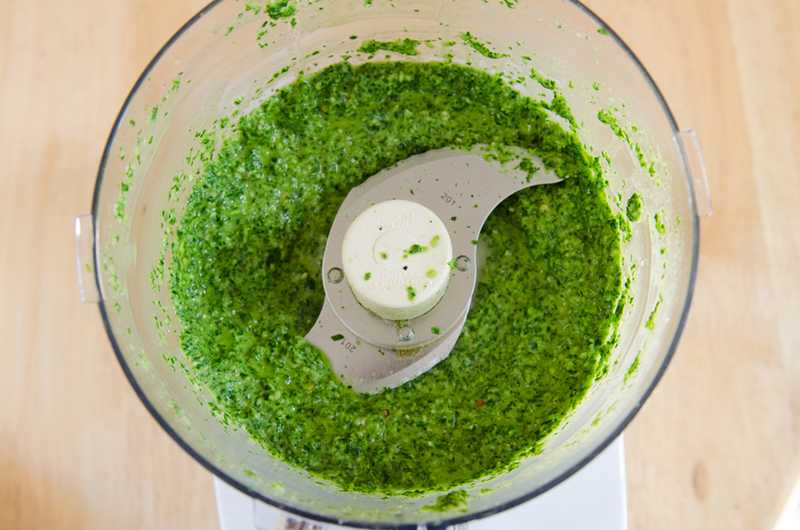 Also, you discover that you would like to eat chimichurri straight from a bowl with a spoon for the rest of the summer. Your husband wont mind. He likes you better when you aren’t hungry. 4) If you go to write a blog post about aforementioned chimichurri and your camera decides to start cashing in its sick days, it’s totally okay to scream into a pillow. You will eventually be able to trick it into uploading one photo at a time. It might take you over an hour with several crazy computer warnings, but you do it. It’s even okay if you eat approximately four cookies before 11am. My beloved camera best friend needs a little TLC. I wish I could just feed it some chicken soup. My hunch is that might make things worse. Off to the camera infirmary with you. Anyways… long story short long, here we are. 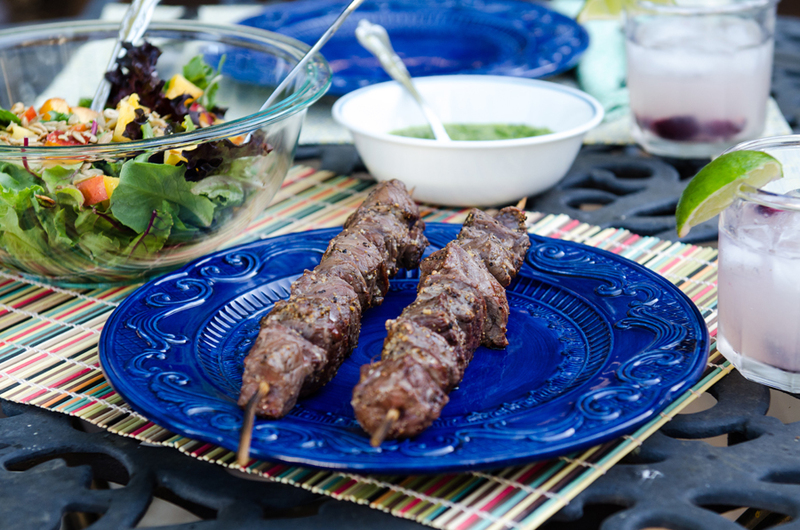 I made you some steak kebabs with a super tangy and delicious chimichurri. Hangry? Don’t worry, we’ve got this. Make yourself a drink. 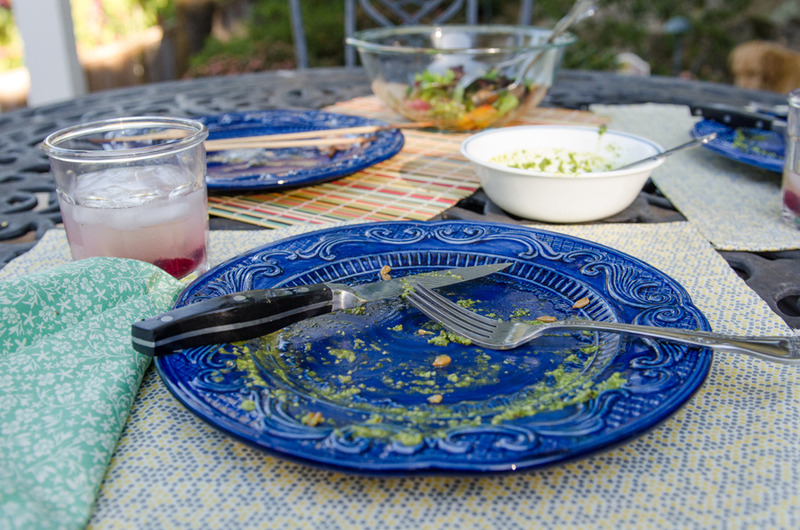 Set the table outside. Maybe eat a cookie. Breathe. Try not to yell at your husband. He really only wants to help you by cutting up the kebabs. He might even clean the kitchen afterwards if you put enough rum in that cocktail. We’re good. Plus, if he grills, you can totally continue not wearing pants. Winning. Shall we whip this up? I think so. All of these things are going to go into your food processor. Did you lock the bowl the right way? You probably did. I really love garlic, so I added a lot into this recipe. 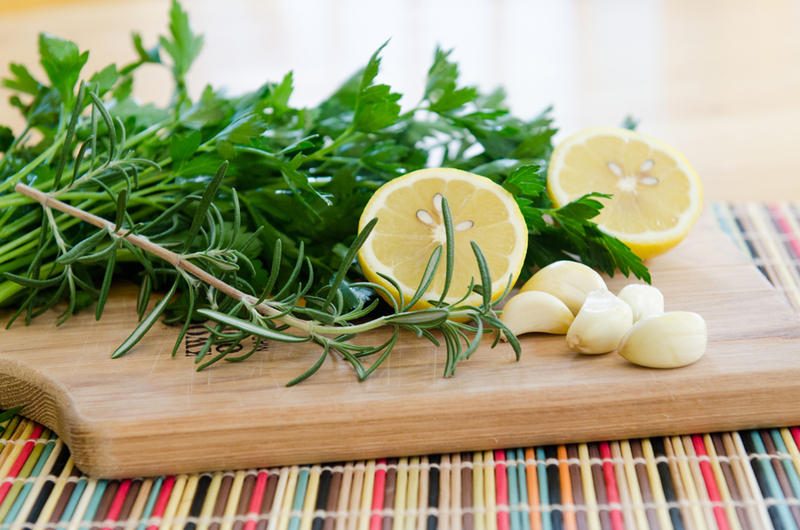 If you like things a little less garlicky, you can totally chill out and use fewer cloves. It’s up to you. Follow your heart. Turns into this. Pretty, right? Now set it aside and go set up your alfresco picnic. Then they are skewered! Let’s grill them up. Do you have that cocktail yet? No? Go get it. You could totally make one of these. Stare at the grilled kebabs adoringly. Waste no time. Serve it up. 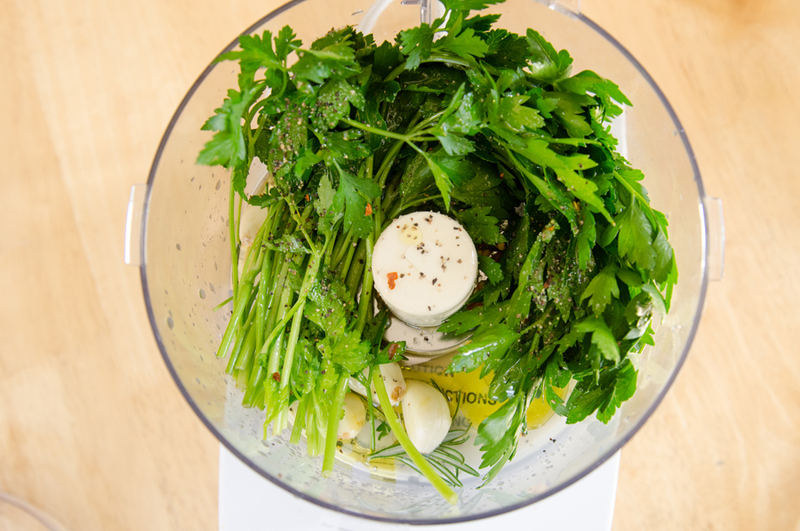 Don’t be shy with that chimichurri. It’s delicious. 1 lb steak, chopped into 1 1/2 inch pieces. 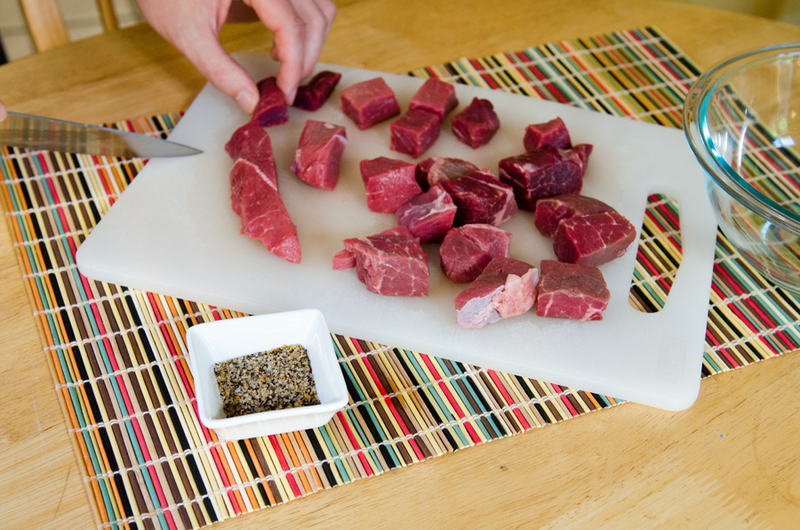 We used sirloin tip, but you can use whatever cut you would like. Soak a couple of wooden kebab skewers in water. In a food processor, add in your parsley, rosemary, garlic, lemon juice, olive oil, apple cider vinegar, salt, pepper & red pepper flakes. Process until almost smooth. Set aside. 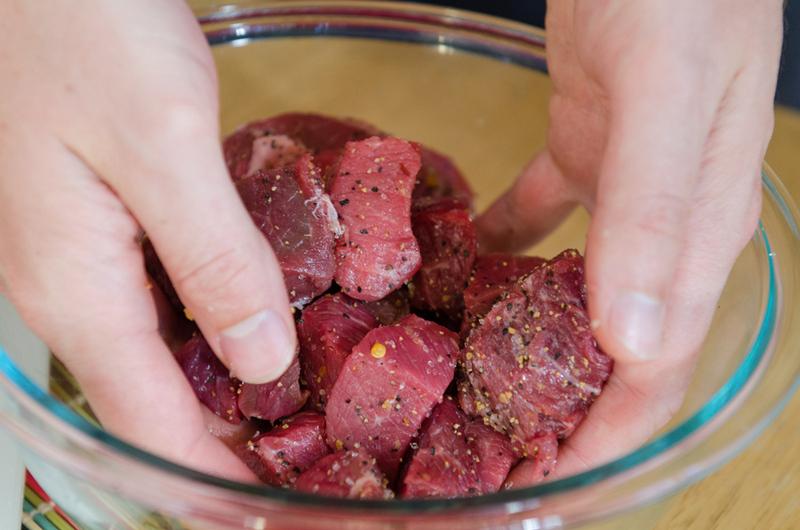 Season and coat your chopped up steak with the Montreal Steak Seasoning. 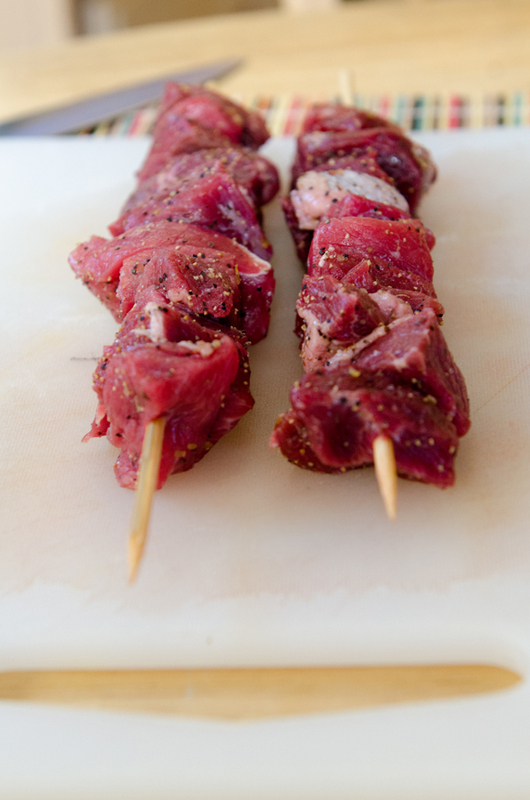 Skewer your steak pieces onto your kebab skewers. Your skewers are going to cook quickly. My husband and I like them medium rare, and we grilled them for 4 minutes a side. Keep an eye on your kebabs and pull them off when they have reached your desire level of doneness. 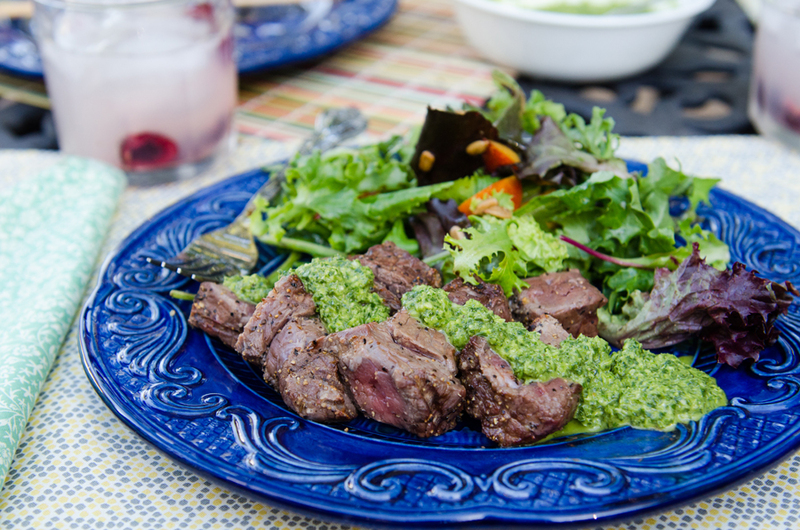 Serve up with a couple of heaping tablespoons of chimichurri and enjoy! Oh my gosh! What a creeper! This recipe looks tasty! I love all of your pictures! What kind of camera do you have? Oh girl this looks amazing. 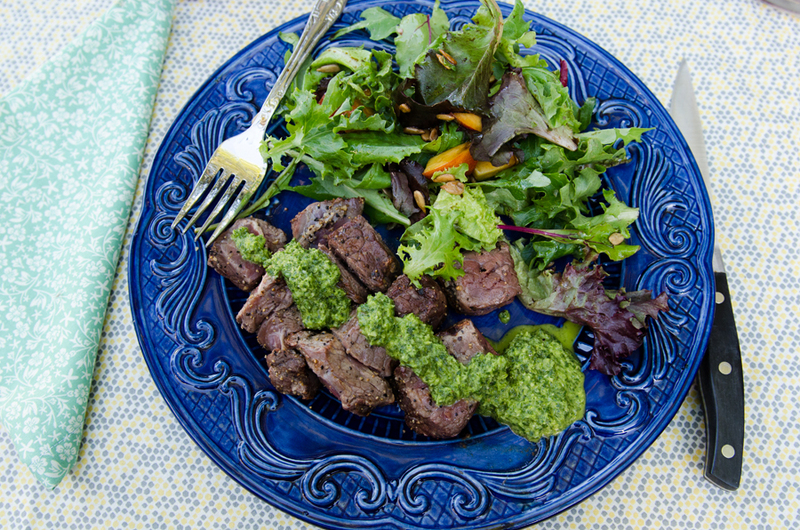 Zoe and John are my steak and meat eaters, so they would love this and topped with that pretty green sauce, yum! I don’t cook enough steak for them and I need to change that up a bit! Oh, I so get the trying to photograph food while your hungry and the household is hungry and you’re stressing out because you just want to eat and not have to photograph every single thing you make and eat. Ok, you can obviously see that I totally understand! Oh, the trials of being a food blogger (such a first world problem though). My family use to wait for me to take photographs of the finished dinner before they would start eating, but now they just start without me. They’re so over it at times 🙂 No, seriously, they are my biggest supporters, much like your hubby is of you.